Zippy Zoo Activity Gym is rated 2.4 out of 5 by 16. Get ready to jump into a jungle of fun with baby! 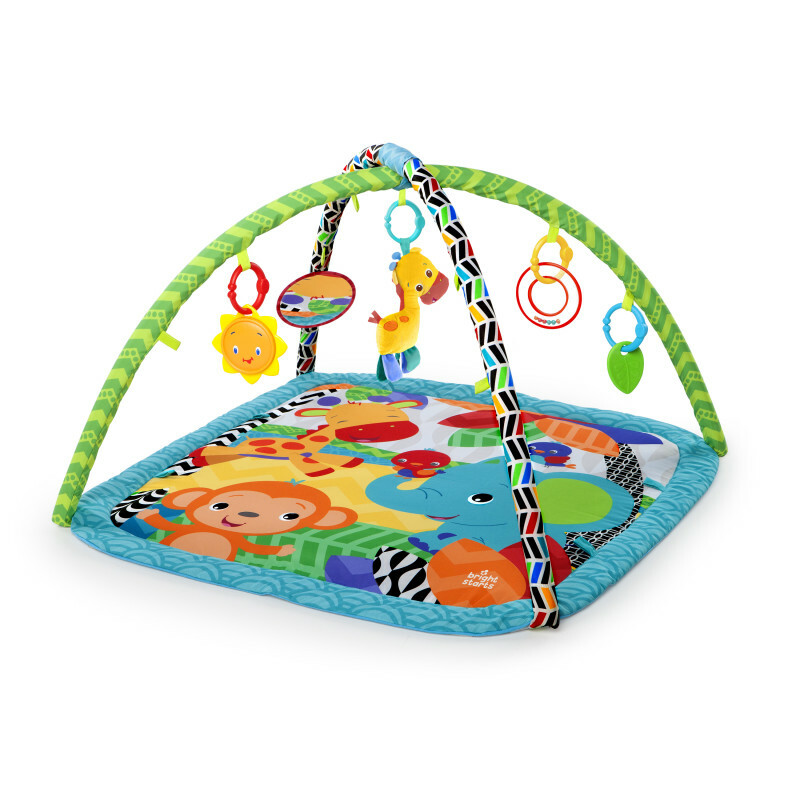 The Bright Starts Zippy Zoo Activity Gym creates an imaginative playground full of fun activities for your baby as she develops, transforming from a tummy time mat into a sit-and-play destination. Let loose your inner wild child as you and baby play together using the five included hanging toys. From making silly faces in the baby-safe mirror to shaking the sun-shaped rattle, this playmat turns any nursery into a zoo time adventure. Watch baby wiggle, giggle and dance along to the giraffe’s four different melodies. Monkey around with even more toys using the four additional link loops along the beams. Wild snuggles and cuddles are just around the corner. Dimension (in) 30" x 30" x 18"
Rated 3 out of 5 by SHANZ from Love the product, short life My kids love this toy but the giraffe only plays like 1-2 seconds of music. They loved the pull giraffe and the new one is a squeeze one....how can a baby use it? The pull tab was better. Heard great things about this product, but really disappointed in the short lifespan. Bought a new pull toy, but it's so quiet, you can hardly hear it. Rated 5 out of 5 by gravy8118 from Perfect cheap alternative We wanted a cheap alternative to the more expensive play mats and this was perfect! The hooks are both on the mat and the foam beams and only one of the toys makes music not the mat but it's really great! espeically when you get a ton of toys at your shower! Rated 4 out of 5 by RebeccaG from Replacement giraffe? My baby loves this mat but I can tell she would like to hear the giraffe play his music again. I would love to know if there is any way to buy the giraffe again separately. Rated 3 out of 5 by Harmonkey from Great for baby but short life I bought this amlost 2 months ago. My baby girl loves it and it keeps her very entertained. I also thought it was easy to assemble. However, her favorite part of the gym is the giraffe that plays music when you squeeze it. It stopped playing music about 2 weeks ago and I can't replace the battery. I wish the giraffe had lasted longer than 6 weeks. I bought this before 2 of the toys we're changed. I have the squeeze giraffe and the round rattle with beads. Rated 1 out of 5 by PWill33 from Not happy My son got this for Christmas & less than two weeks of use the hanging, song playing giraffe quit working. It was his favorite & I cannot find a replacement anywhere!! Rated 5 out of 5 by Keke81 from Easy to assemble Was given as a baby shower gift, found it very easy to assemble and light weight.